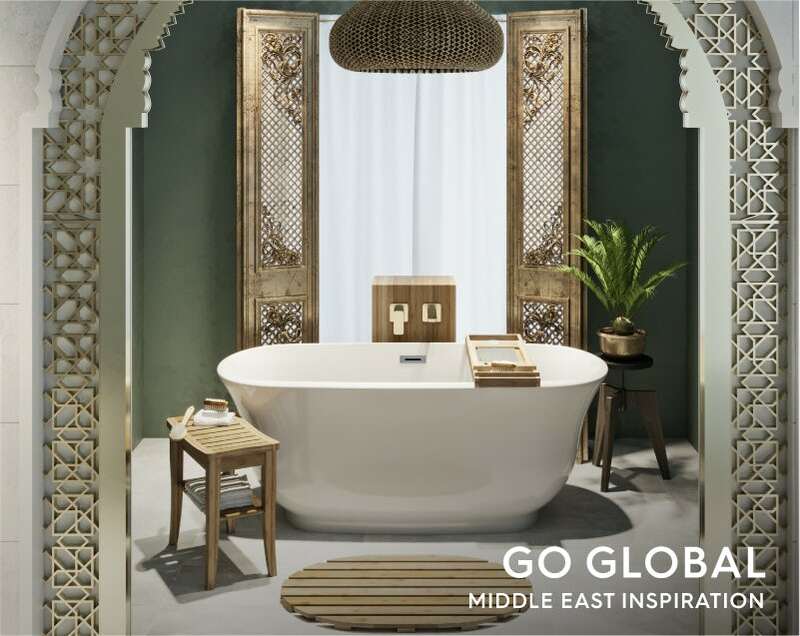 Last but certainly not least on our globetrotting tour of the world’s interiors is the Middle East. Rich in culture and architectural delights, I’ll show you how to create your very own “hidden hammam”* , so you can enjoy the ultimate relaxing space. The Middle East is a part of the world I hold dear to my heart and it’s a region I’ve visited on numerous occasions. On my first journey, I was totally captivated by the friendliness and warmth of the people, the exotic aromas, the mouth-watering foods and vibrant colours. From the hustle-bustle of the souks and bazaars to the absolute serenity of private homes, I never fail to be impressed by the stunning architecture and beautiful interiors I’ve experienced. 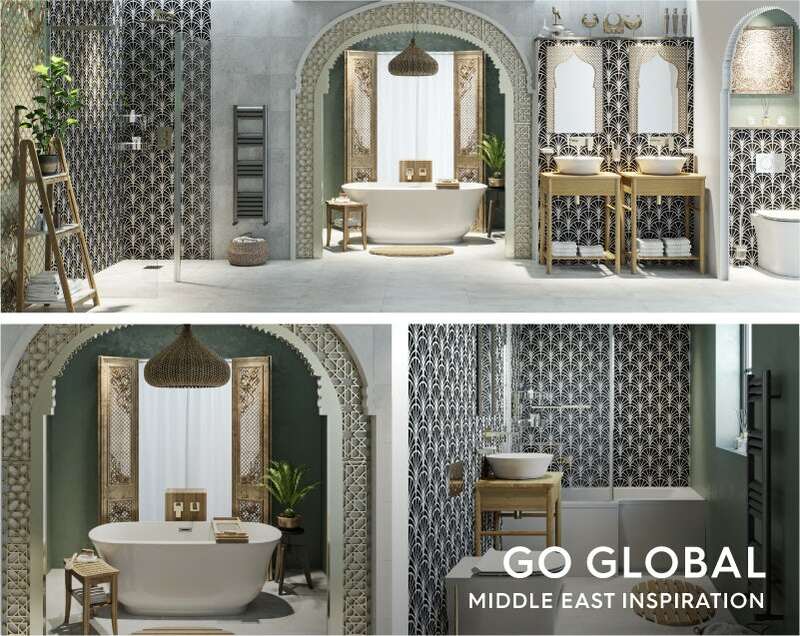 Whilst I enjoyed creating an Indian-influenced bathroom and had loads of fun designing a Mexican-themed bathroom, a bathroom with a taste of the Middle East has genuine personal meaning to me. I hope this style guide inspires you too. *In Islamic countries, where purification is a key part of preparation for daily prayers, a hammam (public bath house) provides the opportunity to experience deep cleansing as well as relaxation for the body and mind. In a part of the world where spiritual needs often take precedence over material items, more thought goes into the look and feel of interiors, resulting in a space that is carefully arranged and luxuriously styled. 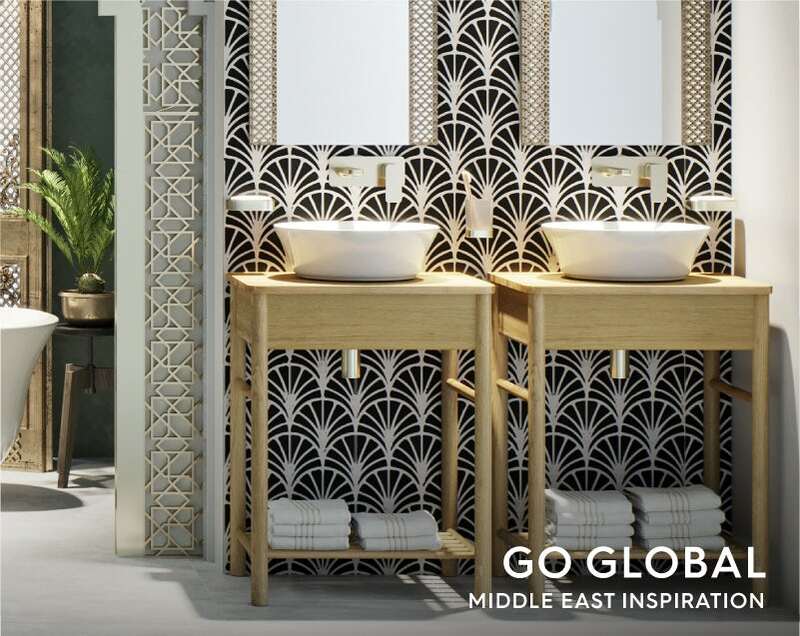 Patterns and motifs figure prominently in Middle East interiors, defining style and bringing depth to your space. I’ve used patterned wall panels around the shower area, basins and toilet, to incorporate this element into our design. Meanwhile, light patterned tiles have been added to the floors and walls, promoting a sense of calm and tranquillity. Green is mentioned in the Quran and is considered a popular colour choice in Islamic culture, which is why we added it to our walls, using paint and additional wall panels. You don’t need to stop at surface finishes to set this style in motion. You can select a range of products which emulate a sense of charm and character with beautiful silhouettes. Decorative archways and traditional shapes have been used to great effect, around doorways and mirrors. Add your own personal touches with treasured possessions you picked up on your travels. The best way to begin any interior design project is by finding imagery you like and styles you love. You can use various sources such as Pinterest, Google and also home magazines and interior design blogs for inspiration. Pick and choose a few textures or finishes and swap them in and out to see which ones you like the most and which ones work best with your theme. Layer them and rearrange them so you can really get a sense of your style before you begin. 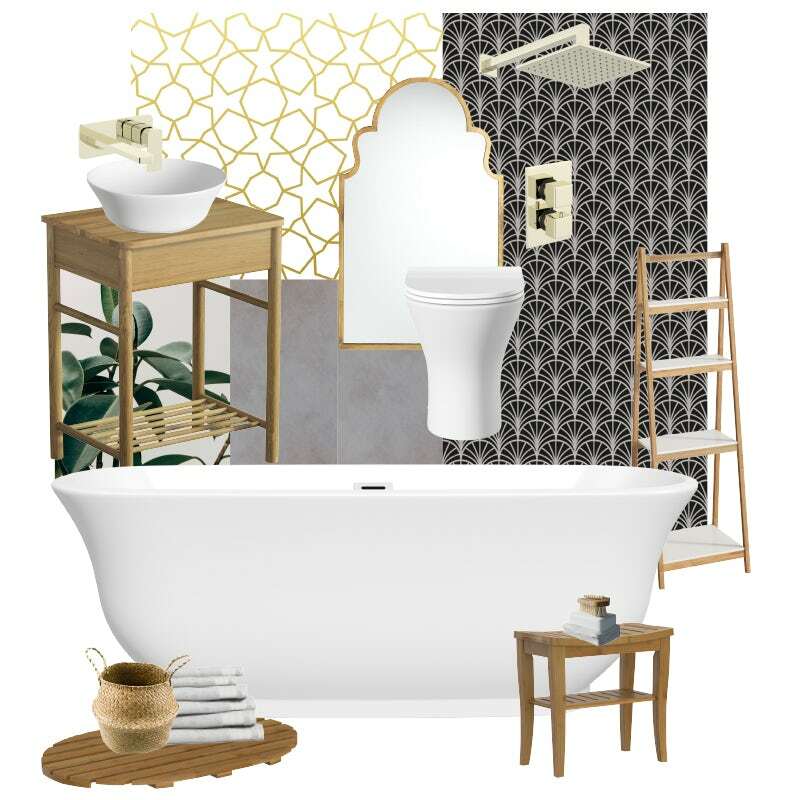 I’ve created my own mood board below containing the key elements for a Middle East-inspired bathroom. Luxurious materials never fail to impress. 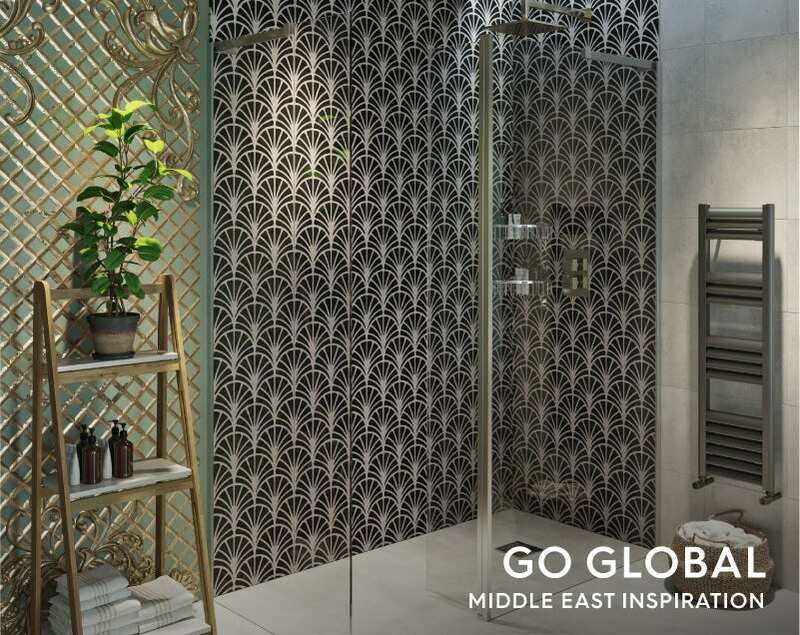 A mixer shower with a gold-coloured finish can add the opulence and richness required to make this look work. Gold replicates the hot summer sun and the finish provides the perfect contrast against the patterned walls. 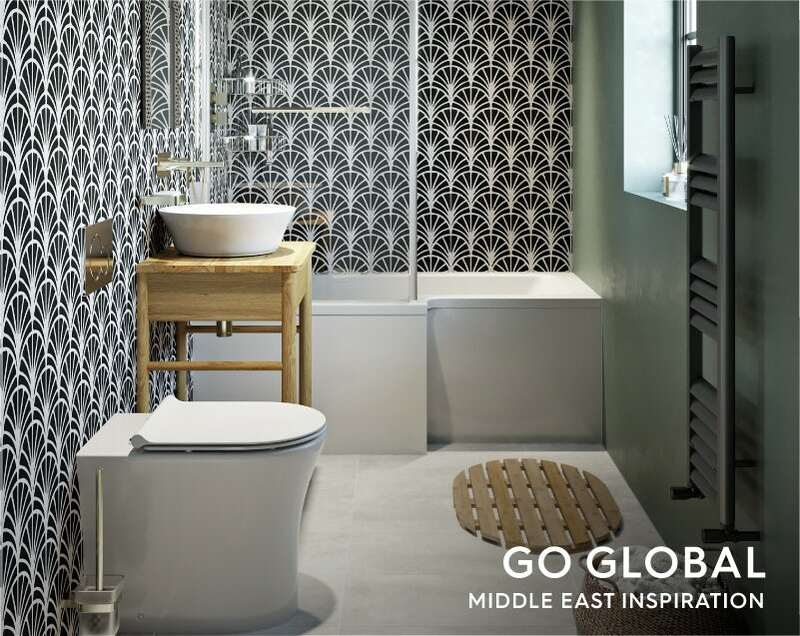 A freestanding bath with ornately curved edges is ideal for this Middle East-inspired bathroom. The design echoes the rounded shapes which feature prominently in Arabian architecture. The decorative archway gives a sense of mystique and fantasy, however, if you don’t have space or time to invest in new architectural features you could simply choose some carved wooden screens instead. The screens I used in my room set have been inspired by Islamic style décor. You can add them to the corners of your shelving, place them onto the walls for decoration or add them to mirrors. Countertop basins work well when combined with wooden washstands. I’d suggest bathroom furniture with slender legs and basins with thin edges to give a sense of elegance—you don’t want your products to appear bulky in this delicate look. To add a sense of separation, we created an archway through to a discreet toilet area. We've continued the patterned theme by using wall panels along the bottom half of the wall. By fitting a false wall, we've added shelf space, as well as a contemporary back to wall toilet installation. We've been selective with artwork and chosen a piece which complements our colour choice. Try to avoid figurative art and go for abstract paintings and calligraphy. That one carefully-selected piece of artwork can really bring your bathroom to life. You certainly don’t need a huge space to create your very own Hidden Hammam. We’ve reproduced the look in an average-sized bathroom to show you just what you can achieve in an ordinary, everyday home. Discover more small bathroom ideas. I hope you had as much fun reading this style guide as I had creating it. 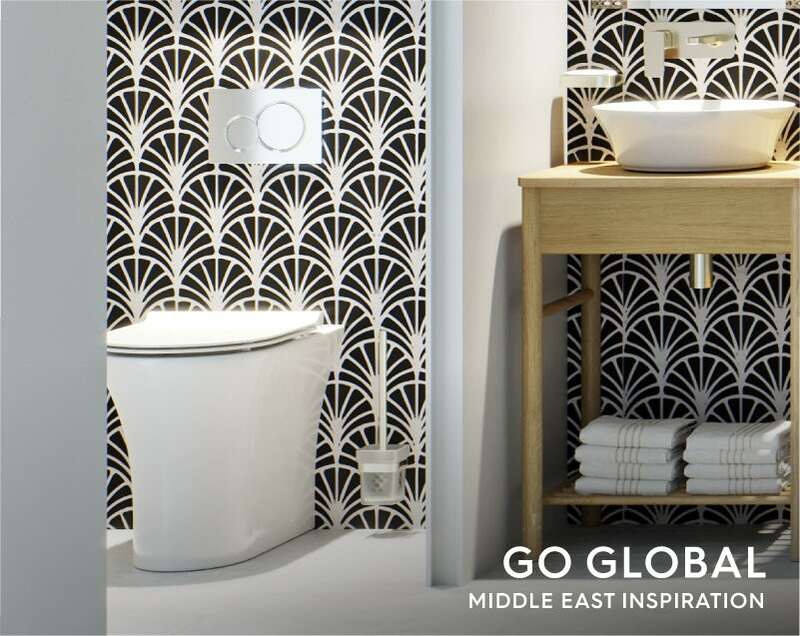 If you’ve been inspired to “Go Global” with your bathroom design, why not take a look some of our other bathroom designs by clicking on the images below. Next week, I’ll be wrapping up our Go Global theme, showing you exactly which products you’ll need to achieve your favourite look. Go on… be adventurous.